Fall is a beautiful time of year. The leaves change colors and fall. The apples are ripe for the picking. The air becomes crisp. It is the start of the new school year and other new beginnings. 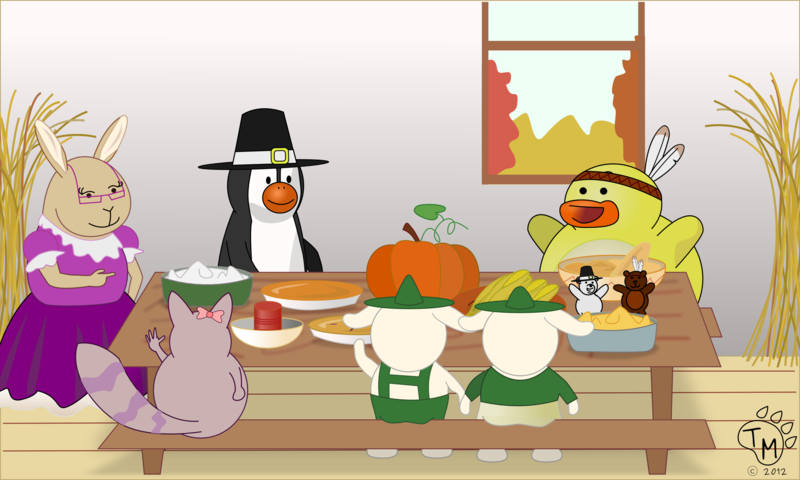 Ducky and the gang love fall. They enjoy playing in the leaves, apple picking, and most of all Halloween. Every year, they go to a local pumpkin patch and pick the perfect pumpkin for carving. Unfortunately, in Israel we don’t know where a pumpkin patch is, and the local stores do not have traditional American style pumpkins. Then today at the grocery stores, we saw the cutest little acorn squash! They are perfect for DtPb, and helped get them get into the holiday spirit! Plus later tonight the humans are making pumpkin spice cookies (from the US!). *Sorry we haven’t been blogging like we would like. We enjoy Ducky Adventures so much! But this past year has been very difficult (with cancer on both sides of the family and the passing of Laura’s mom). 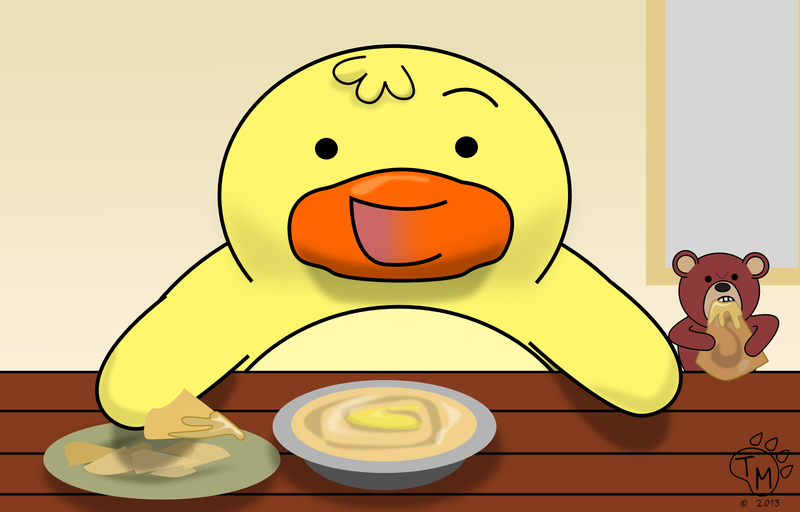 While we’ve been dealing with a lot, it’s time to start up the Ducky blog again.Thanks to everyone for being patient and spread the word- Ducky and the gang are back! That evening, the dinosaurs held a special celebration for Ducky and the gang. A feast was prepared with lots of desserts. A band played the jugs all night, while everyone danced and played games. 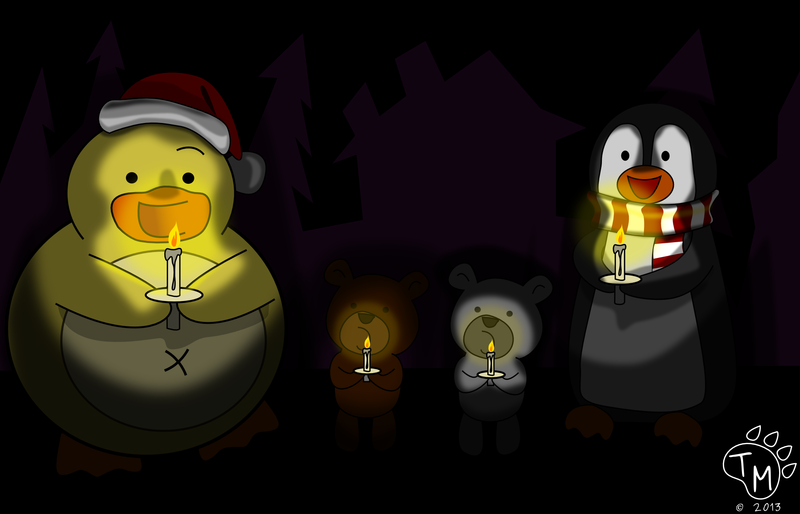 Then when night fell, the dinosaurs, along with Ted and Blizzards help make fire dance in the sky with paper lanterns. They watched the lanterns float in higher and higher, late into the night. In the morning, Ducky and the gang didn’t want to leave Xanadu, they had to get back home. 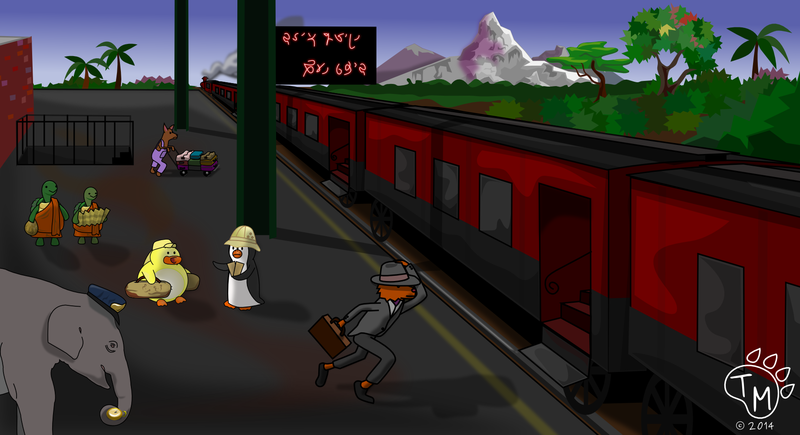 Abigail and her father were safe, and Professor Plumbottom was captured. This adventure had come to an end, but they knew in their hearts there would be more adventures to come. Look at all the pretty lanterns. One thing Ducky and the gang have learned since being in Montreal is that it is COLD! While Ted, Blizzard, and Pembleton are enjoying the colder weather, Ducky is having a hard time staying warm. At first he tried a nice mug of hot cocoa, but that doesn’t last very long. Then he tried a blankie, but that only gets in the way when playing with his toys. So Pembleton had the idea of getting some cool new PJs from Mr. Moose’ Canadian Comfort store that would keep them warm, but also stylish. 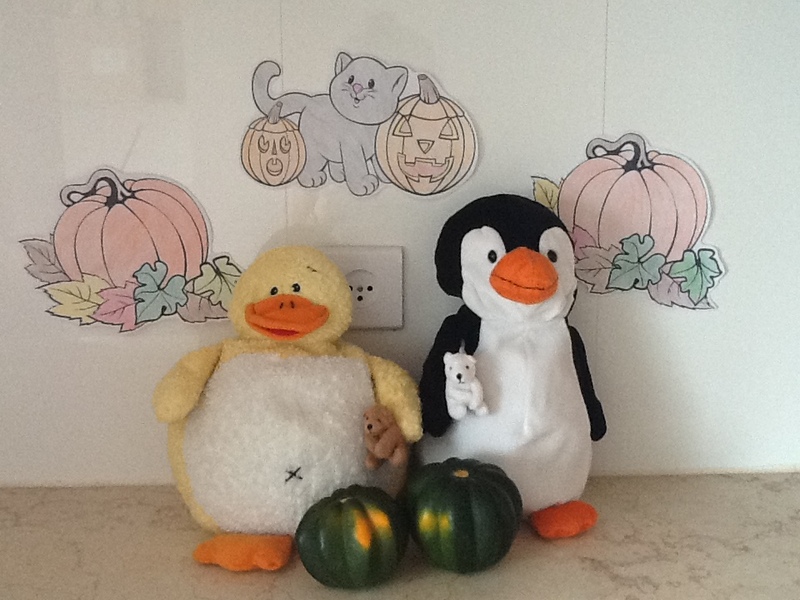 Ducky chose the dino pattern, while Pembleton went with the space pattern. Ted and Blizzard’s fur kept them warm enough, and decided PJs would make them too warm. While their new PJs keep them nice and warm, they still enjoy a nice cup of hot cocoa and a blankie while cuddling up on the couch. Even Ted and Blizzard. We look good in our new stylin’ pjs! 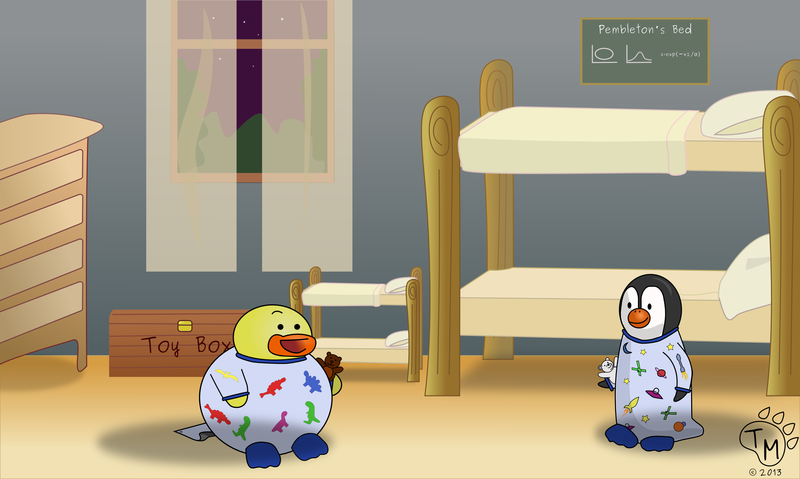 Ducky Adventures Turns One Years Old! Happy Birthday To Ducky Adventures! Ducky and the gang have been apart of our family for years, but it wasn’t until last year that we finally shared them with the world! 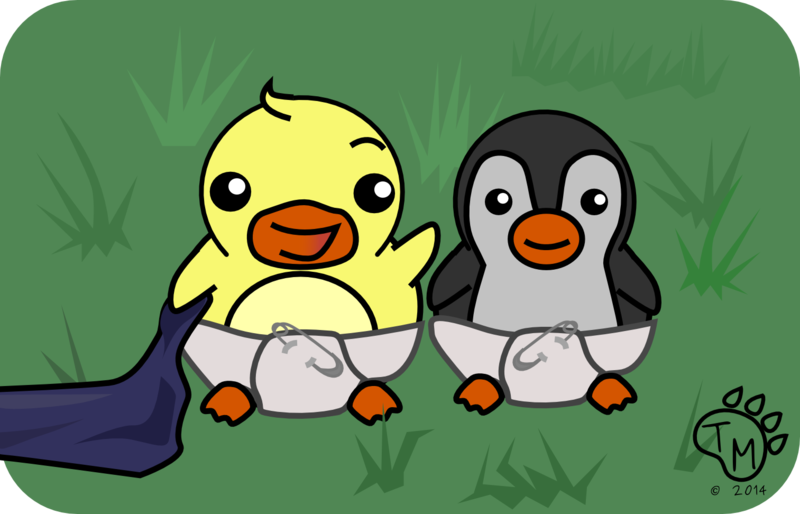 On September 18th, 2012 we posted our first blog post on Ducky Adventures (Hello World). Since then, it has been a fun and wild ride. In between school, work and traveling in our real lives, we have gotten to explore their amazing world with Ducky’s Business Tips, Pembleton’s Labs, and some of our series (Case of the Missing Sloth and Mystery of the Desert Sands). This year we posted 153 blogs post and hopefully we will post even more this coming year. We had such a fun year, and we can’t wait to see what happens in the next! Some (but NOT all) favorites! One small step for Ducky; One giant leap for Animal Kind! They slowly entered the room, not knowing what to expect. 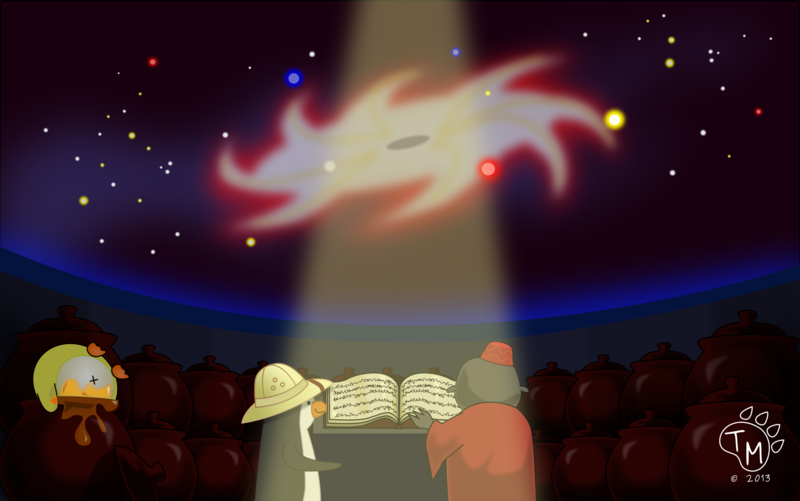 On the ceiling there was an colorful mosaic depicting a galaxy and hundreds of stars. It was so beautiful, they almost forgot why they were there. At the top of the ceiling there was an oculus letting in a beam of light, shining down onto a pedestal in the center of the room. “What is this? A BOOK! We came all this way for a stinking BOOK!? 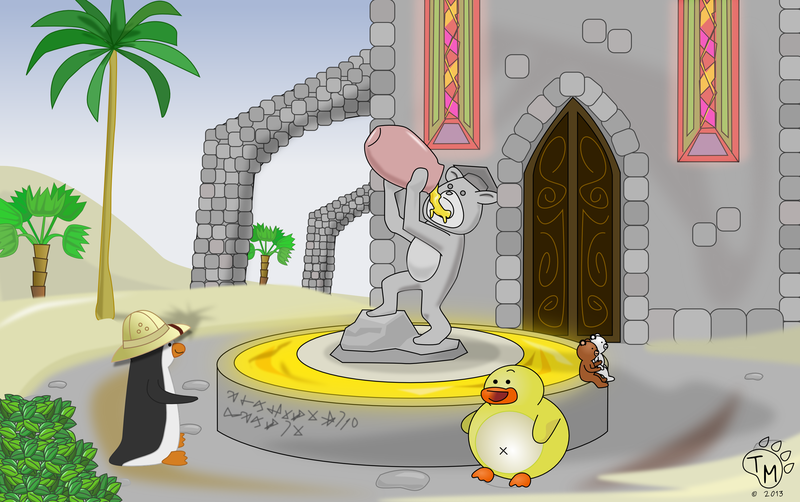 !” Ducky shouted as he looked at the pedestal. “Wait a second! Ducky. Books can be very valuable treasures. I need to examine it.” Multilingual Mole said as he and Pembleton took a closer look. “What are all those pots for Ducky?” Ted asked. “Maybe those are filled with treasure.” Blizzard added. “Wait Ducky!” Pembleton shouted, but it was too late. Ducky had already dived in. As Multilingual Mole and Pembleton thumbed through other famous and delicious recipes Ducky, who had finally gotten unstuck from the honey pot came over and asked, “So what’s this your looking at!” Everyone turned to Ducky and gave him the stink eye. “Weren’t you listening?” Pembleton asked. “Actually, it’s a little hard to hear. I have honey in my ears.” Ducky replied. Once they had examined the treasure. They made preparations to return to the nearest city. There they reported the cat pirates to the authorities and told them their location. Then Multilingual Mole and Pembleton held a press conference, announcing they had uncovered the Mystery of the Desert Sands. Amanda Panda and Penelope Penguin, donated their pendents to a local museum and in appreciation of their gift, the museum had two replicas made for the girls. 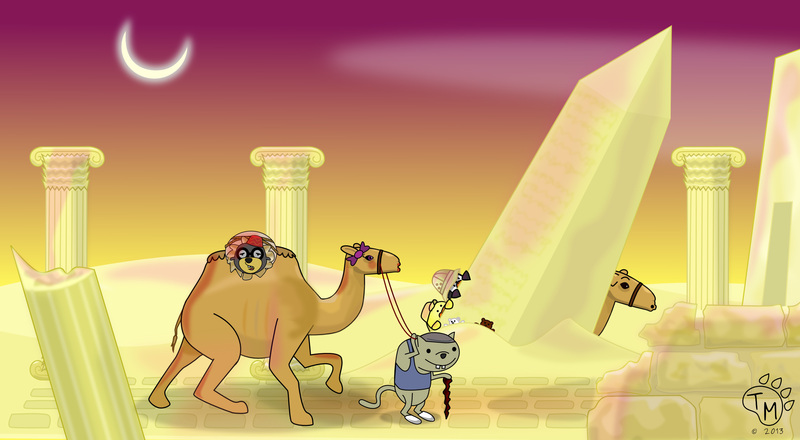 Cornelius questioned the female camel that had been working with the cat pirates and was relieved to find out she had no idea what they were up to. Before handing the recipe book over to the museum for safe keeping, Ducky and the gang made a batch of Mama Bearistotle’s baklava! It was so good, they had to make another. Unlocking the Mystery of the Desert Sands. Before handing over the pendants, Amanda Panda and Penelope Penguin slid the two charms together. 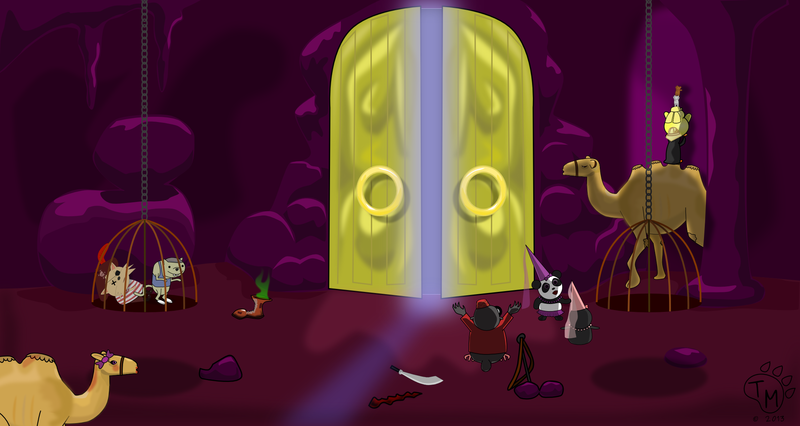 The halves formed the key Multilingual Mole would need to open the massive, ancient doors that stood before them. “What does that mean? Haven’t we done enough teamwork for one adventure?” Ducky asked. “I think it means that it will take all of us to unlock the mystery and the door.” Pembleton said. “But how? I don’t even see a keyhole”, Amanda said, as she looked back and forth between the pendent and door. “I think we might be too little”, said Ted sadly. “Yeah, look how big those doors are, and how little we are”, Blizzard agreed. “What does that mean? Are you drinking enough water? I think you might be loosing it!” Ducky replied. They all climbed onto Cornelius’ back to get a better view. They searched for anything that might match the shape of the pendent. After searching for several minutes, Penelope tugged on Pembleton’s wing and then whispered, “Do you think that could be it? Up there?” she asked. “Yeah! I think you found it!” Pembleton shouted with joy. He startled shy Penelope, and caught her before she fell off the hump. Both of them blushed a little, but then they got back to work. 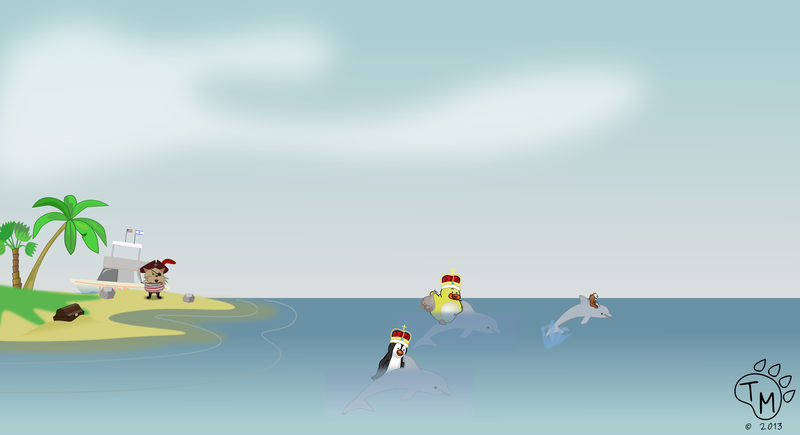 Ducky, Ted, Pembelton, and Blizzard quickly formed an animal ladder on top of Cornelius and passed the pendent up the chain. Once Ted, at the top, received the pendent, Amanda told them, “Scoot to the right. No the other rights you nimrods! No, now that is too far! STOP! 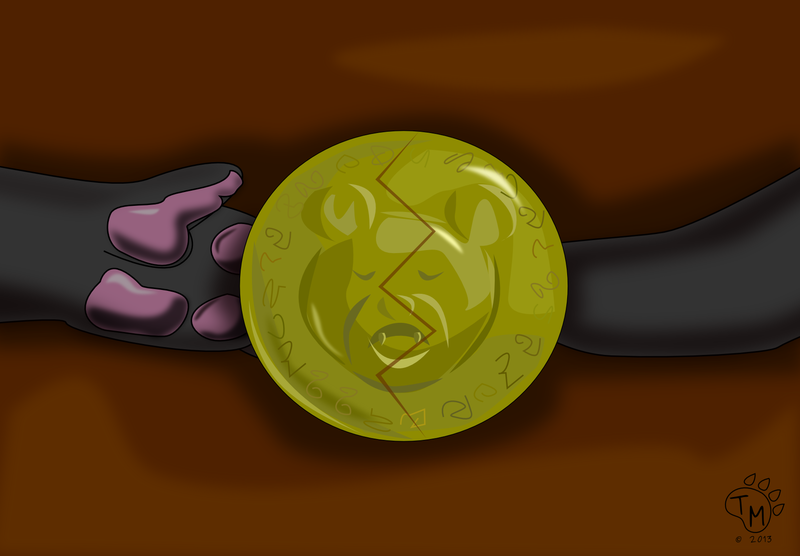 Right there Ted!” Then Ted slid the pendant into the cave wall and pushed it into place. There was a loud click, but then nothing happen. Stay tuned for the GRAND FINALE! They looked everywhere for the trigger mechanism that must open the secret passage, but they couldn’t find it anywhere. Eventually Ted and Blizzard got tired and started to play in the sand. 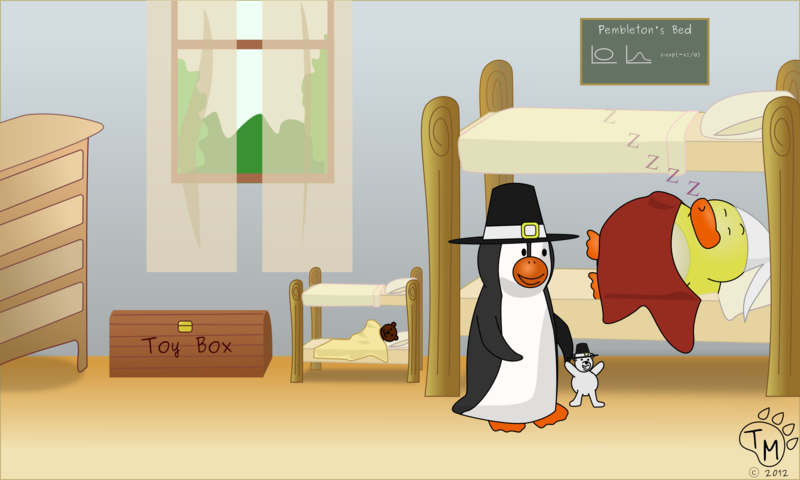 Cornelius decided to take another nap, but Ducky and Pembleton kept searching until the Sun started to go down. 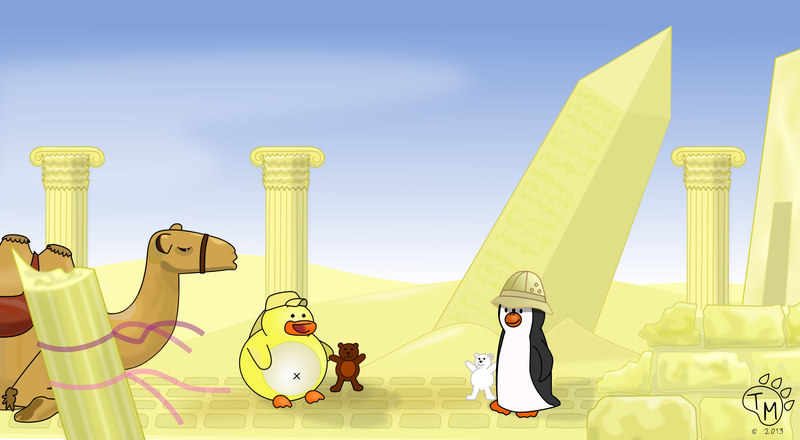 Ducky, Pembleton, and Cornelius hid behind a giant obelisk, while Ted and Blizzard hid behind a sand dune. They waited for what seemed like forever before anyone but Cornelius could hear someone coming. Then they saw Captain One Mittin’s first mate, Egor, leading a camel with a large sack through the desert. When the camel, wearing a large purple bow, got closer they could see that the sack actually contained a prisoner. Cornelius tilted his head to get a better look at the female camel. Losing his mind with infatuation, he was about to whistle, when Pembleton managed to clasp his wing over Cornelius’ lips. “Get a hold of yourself”, Pembleton whispered harshly. Then they watched as Egor walked directly toward the wall where they had seen the foot prints leading into the wall. Egor hopped on top of the female camel’s back and used a gnarled staff to press a tiny button high up on the wall. The wall itself began to slide away revealing a long dark tunnel. When Egor was out of sight the wall slid back into place. Pembleton examined the button that Egor had pressed to open the secret entrance. It was too high to reach even on top of Cornelius’ back. “How are we going to reach that button?” asked Pembleton. “Wow! Good thinking Ducky”, agreed Ted and Blizzard. “See! I packed some useful stuff”, said Ducky. Pembleton reluctantly climbed on top of Cornelius and used Ducky’s stick to press the button. 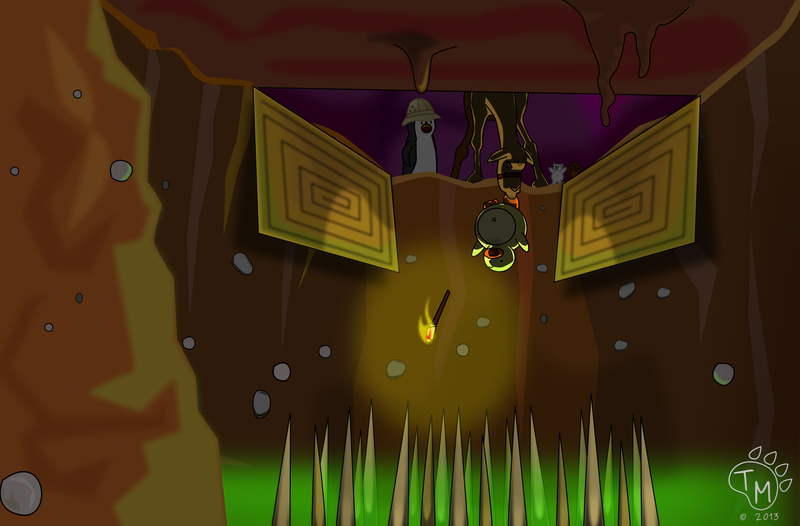 The secret door slid open and they entered the long dark tunnel. Shhh… be very, very quiet. 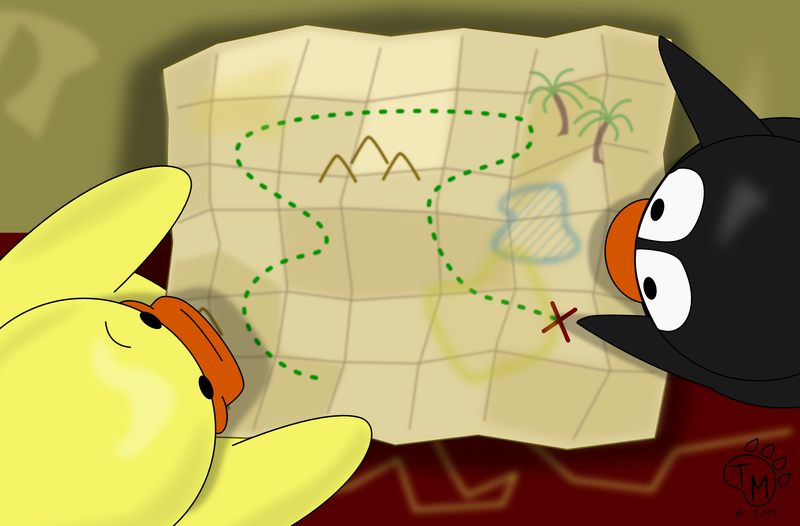 Once Ducky and Pembleton made sure the poor monkey was being taken care of, they returned to their investigation of the map. “Where is this map leading us?” Pembleton asked. 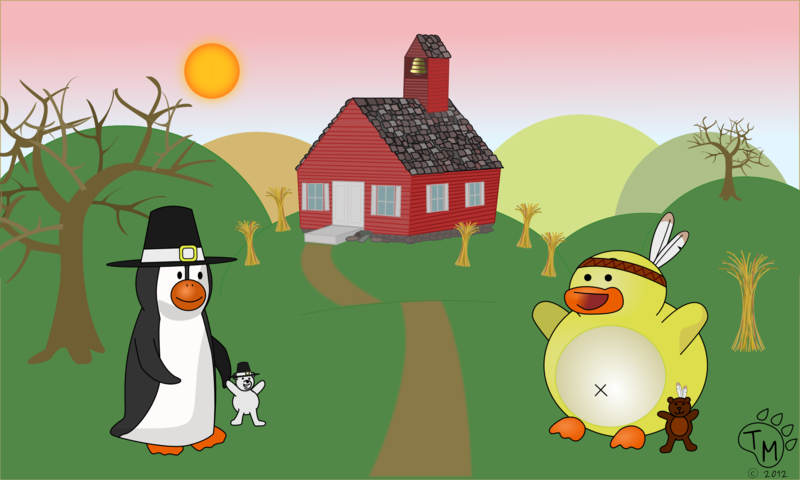 “Obviously to the giant red ‘X’!” Ducky answered. “But where do we start?” Pembleton asked. “Wait, just one minute.” Pembleton said. Pembleton sniffed the map and his eyes grew big. Ducky knew he was on to something. His super sniffer was never wrong. Pembleton walked over to the table and grabbed a lemon. Now Ducky was just confused. Why did he need a lemon? Then Pembleton squirted the lemon juice over the crusty area and held it over a candle. Soon a secret message appeared in light brown letter. “How did you know how to do that?” Ducky asked. “It’s simple science, you see…” Ducky quickly cut Pembton off. “You can tell us later. Do you know what this ancient scribble means?” Ducky asked. “No, but I know someone who does.” Pembleton said. He quickly grabbed his emergency phone and took a picture. “Multilingual Mole will know. He is a professor of ancient texts.” Shortly after sending, Pembleton received a text message back with the translation: TO UNCOVER THE MYSTERY OF THE DESERT SANDS, ONE MUST THIRST FOR KNOWLEDGE, AS BEARISTOTLE ONCE DID. “Huh?” Ducky said as he scratched his head.